You may be familiar with the famous words of American Manifest Destiny, “Go West, young man!” I’m pretty sure Horace Greely had this game in mind when he wrote that. A limitless frontier lay open for hard-working, honest, and romantic pioneers, just like in Dark Horse. Vast tracts of fertile land lay free for claiming, teeming with a wealth of resources ripe for the picking, just like in Dark Horse. Only the resolute and determined will stamp their industrious legacy upon the virgin wilderness, just like in Dark Horse. Are you up to the task of taming the Wild West? Harness the land’s resources to found cities and towns, while building a network of railroads to link them all together. Rewarding toil, adventure, liberty, and victory points can all be yours! 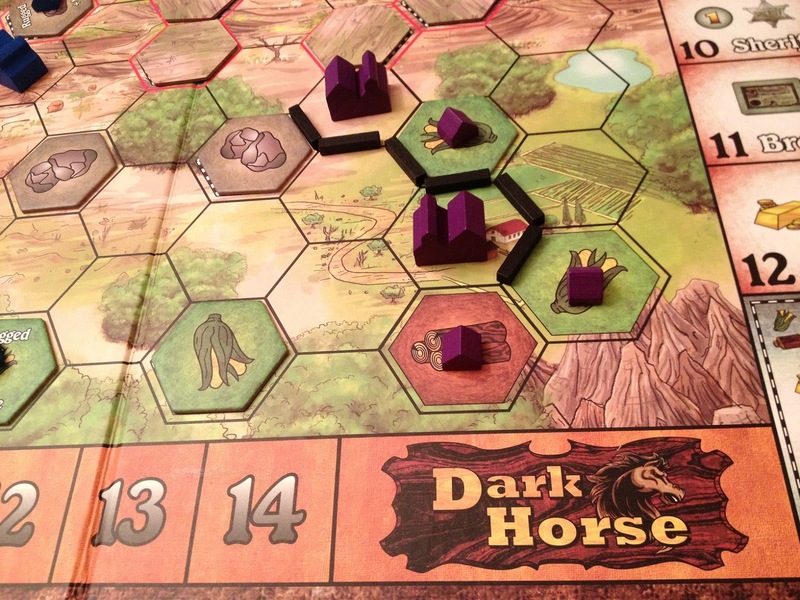 Dark Horse is a worker placement and resource management game, with a dose of simple route building. 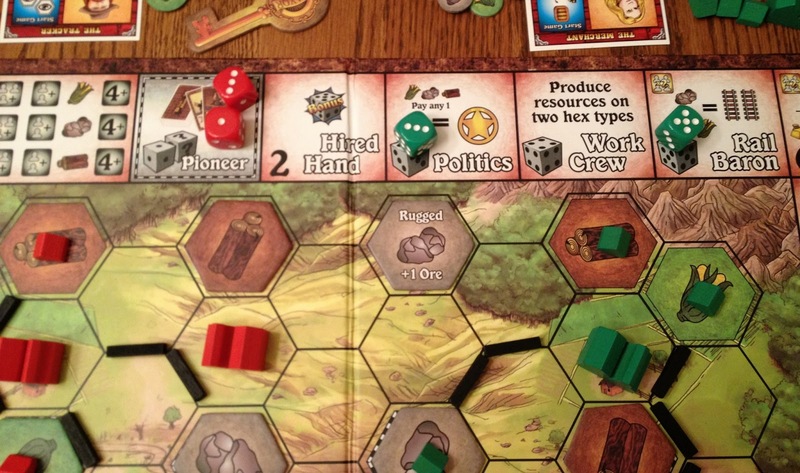 Your workers are represented by rolling dice and matching the results to various tasks (in the manner of Kingsburg and Alien Frontiers) and you will spend resources to develop the board by building cities, towns, and railroads (in a fashion similar to Settlers of Catan). To be clear though, the similarities end with those over-arching mechanics. Dark Horse includes variable powers, random event cards, a bit of exploration, and some elements of role selection and “take-that” interaction. This design is not simply Settlers of Alienburg, but rather stands on its own in good stead. Prior to beginning, everyone is given a unique character with variable abilities that will usually guide and inform their strategy. You also start with one city and two towns. 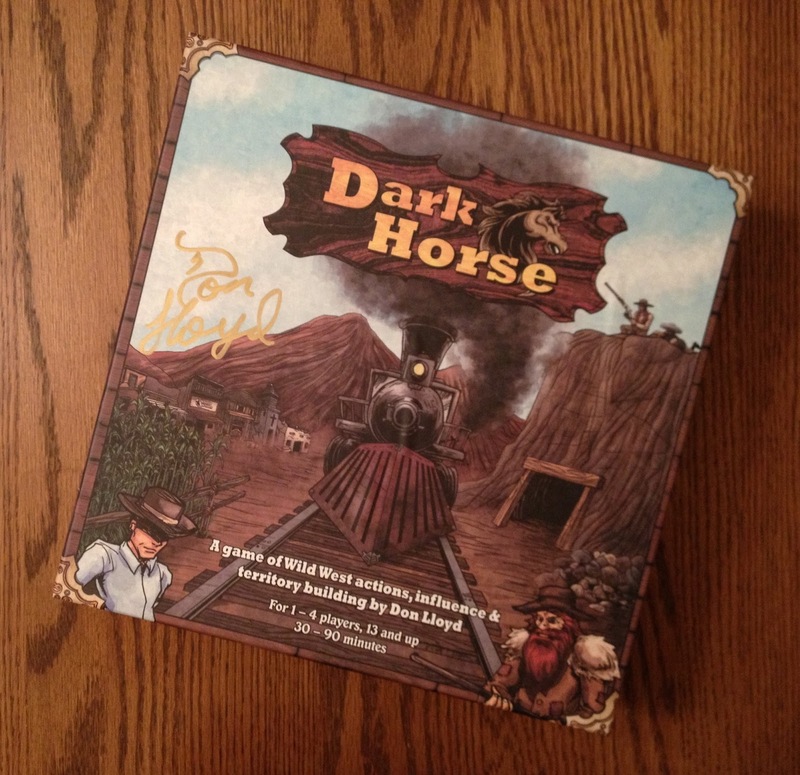 From this humble point, you will expand your territory, discover and exploit new resources, and build a network of rails for the mighty steam trains to scream across the prairie – the titular dark horses. Very nice production value (especially for an independent publisher) on all of the many bits. The end goal is to earn points – despite the use of dice and the Western theme, this title has a distinct Euro game flavor. Points are scored by building cities and connecting them to towns by rail, earning influence, holding gold, or serving as Mayor and Sheriff when its all over. If you’re not careful, you can lose points by being in debt or having a worker in jail when the game ends. That end is triggered either when one player has built all three of their cities and all six of their towns; or when some one has reached a pre-determined target on the Influence Track (11 is the suggested default). The first in either case is not necessarily the winner, although he/she will certainly be in good shape. Game play is divided into two phases. In the Placement Phase, each player rolls their dice and places them on an action space. Usually you will have two dice, but you can also obtain a third, bonus cube through selection of a particular action. There are seventeen boxes around the top and right-hand side of the game board that provide a variety of benefits. Each one is numbered and players alternate placing one or both of their dice to a corresponding box of matching number in order to take advantage of its production or ability. Some actions simply give you cards or resources. Others let you trade items. A few allow you to pay resources or gold to build. 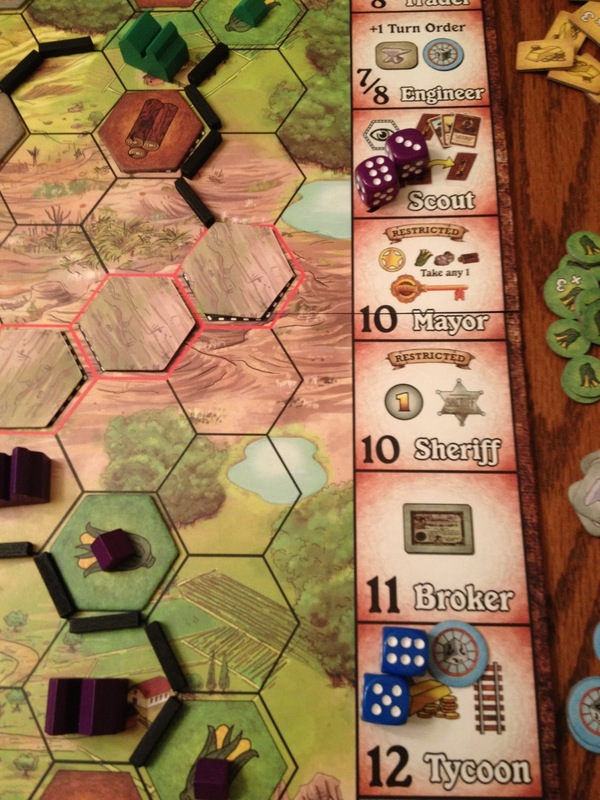 Producing resources – as long as you have towns on the same type of hex. As a dice game, you might be thinking it not uncommon to roll poorly now and then. In that case, you would be right. Not to worry, there are also a few actions that provide opportunity to alter those unwanted results in some fashion. There are Wild Die tokens that let you re-roll one or more dice, or let you place one spot lower or higher than the result of your die or dice. Also, Engineer tokens come in very handy. Those let you simply change one die to any number you wish, or instead you may use the token to place in a restricted box that another player has already claimed. The majority of spaces are restricted to only one player a round, so competition can be tight. There are some interesting exceptions as described later. Plus, there is no rule requiring that you actually be able to afford or perform the action indicated in order to first claim an action, so flat-out blocking is allowed, adding to the tension. Any number of players can claim the grey Pioneer. 2-5 all require a natural roll. After all worker dice have been placed, the Collection Phase begins. All actions are resolved in order, beginning with the first box and then on around as applicable and necessary. Besides collecting resources, influence, and tokens, this is where players will build. The Rail Baron box allows you to lay a couple sections of track for the cost of two ore and one food. These are placed along hex edges and are important for connecting cities and towns for production of resources and final scoring. A settlement is considered to be connected as long as one rail section is adjacent to or touching the hex in which it has been built. 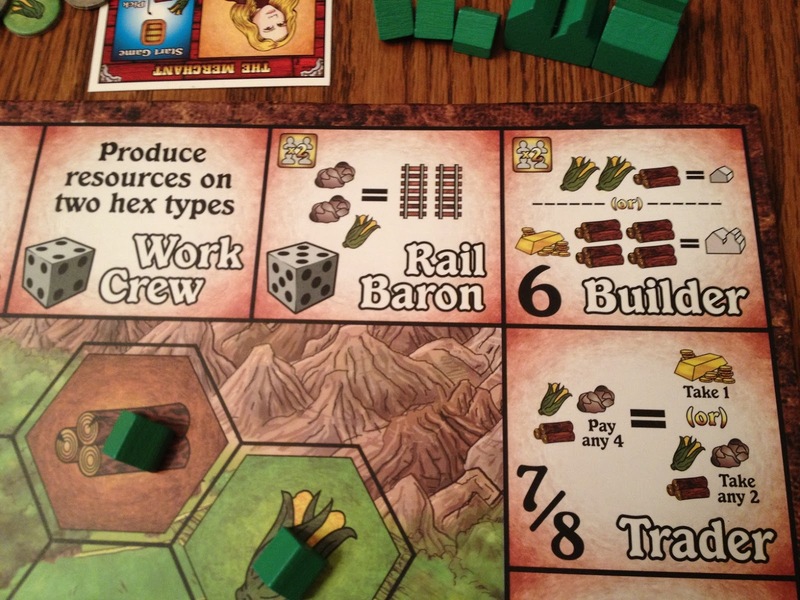 The Builder action allows players to erect towns (two food and one wood) and cities (four wood and one gold). 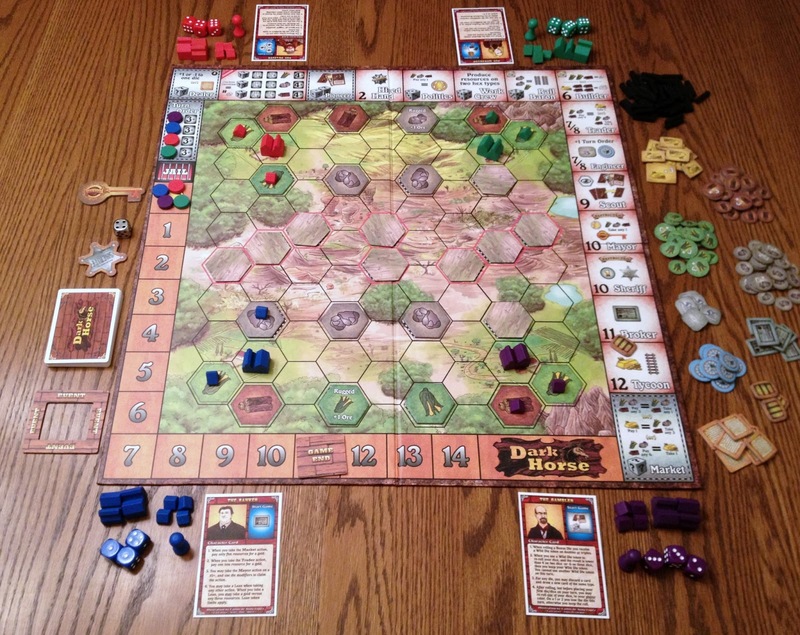 Towns must be placed on resource hexes which are seeded according to specific rules at the beginning of the game. When a certain action is claimed, towns can produce the specific resource upon which they’re built – but only if adjacent to a city or connected to one by rail. Cities are built on non-resource hexes, but new cities can only be built once the railroad has reached the hex you wish to develop. 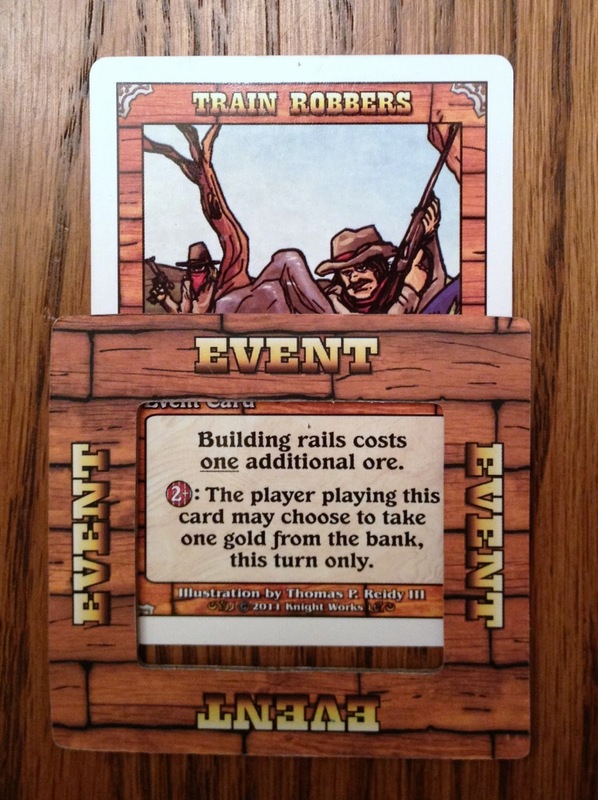 One last major element to Dark Horse is the deck of action and event cards. Two of the worker placement boxes allow players to draw from this deck which can alter game play – usually significantly. 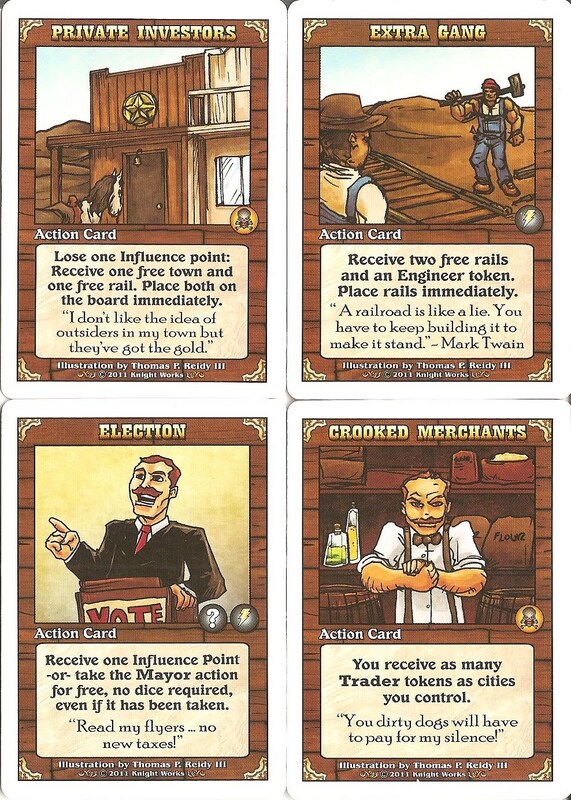 Action cards give their owners a special bonus or benefit. Event cards introduce a new rule, usually an obstacle-type twist, that affects all players and remains in play until a new event card replaces it. Current event card in play. Take a Ride on these Rails? I’ve always been a fanboy of the Western genre. Growing up in Kansas, I was immersed in frontier history and fascinated with Native American culture, both of which are big on the Great Plains. I’m pretty sure I’ve seen every Western that John Wayne and Jimmy Stewart have starred in and my favorite author as a boy was the tireless Louis L’Amour. Suffice it to say – and to dispense with right away – even though it’s not integrally thematic, if you like Westerns, you’ll enjoy Dark Horse. But under that veneer, what grit lies beneath? All of the core and secondary mechanics are fairly standard, but integrated in a fresh way with some slight twists. That is perhaps most prevalent with the base worker placement element. The sheer breadth of seventeen actions to choose from is much greater than the average game of this genre. And even when a dice placement game like Kingsburg offers eighteen choices, you have three or more dice with which to reach those higher numbers. Dark Horse only gives you a couple, unless you spend one on an action to gain a bonus cube for use in your next turn. Therefore, even though you have plenty of options, you’re only able to claim one or two. For those actions at 6+ requiring both dice, then obviously it’ll be only one action that turn. This restriction makes for some tough choices that adds tension and stretches your strategic planning. The prime locations are located down the right-hand side of the board. Another variation that sets this title apart from its cousins is the action space types. Most worker placement designs restrict use to one player per location, which allows blocking opponents from claiming a desired action. That is still predominant in Dark Horse, those spaces being called “limited.” However, there are also “reserved limited” spots that may allow more than one player to claim based on specific rules (especially player numbers). There are “restricted limited” actions requiring a non-modified, natural roll. Finally, four of the boxes are identified as “unlimited,” allowing for any number of players to claim with their dice. The good thing about these is that they are not simply pity options for those left out of prime locations. Two of the four are actually good options under certain conditions, while a third one is always a good choice. The fourth alternative is not bad, though admittedly a lesser alternative to another limited action space. While the dice rolling provides for a good deal of variability, there are also more modifiers than the average title of this ilk to deal with poor results. The Wild Die and Engineer tokens, mentioned above, can already provide significant swings. There is also an action space that, for the cost of any one die, lets you immediately place a die or dice on an action that is one space higher or lower then the result of that die or dice. These various modifiers give you more control than perhaps other dice allocation games. However, one must still keep in mind that a handful of action spaces require natural rolls, unaltered. Builder (6) is the name of the game while Trade (7/8) lets you manage your resources for building. Dark Horse has a bit more crunch and fiddliness than most examples in its style, with a number of extra minor rules and tokens dependent upon selected actions. You can take loans of any three resources, but must pay it back twofold or lose points at the end of the game. You can earn stock during the game to cash in for resources or gold. You can wind up in Jail for a turn or better. And there are other tokens and rule-breaking abilities based on temporary roles, character cards, special actions and events. The roles of Mayor and Sheriff are temporary positions claimed by actions on natural roles of ’10.’ You hold the job title until ingloriously booted out by another. The Mayor receives some nice initial spoils upon entering office and then may always take the Politics action space for free, presuming you have the right die. 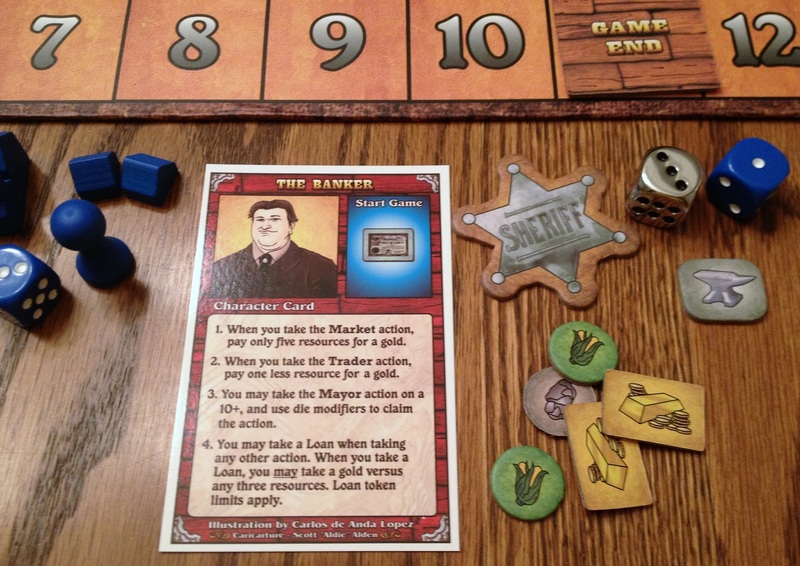 The Sheriff immediately moves to first in turn order and switches one of his die with the Deputy Die. This can be flipped to its opposite side after rolling, if desired, although it must then be used by itself. 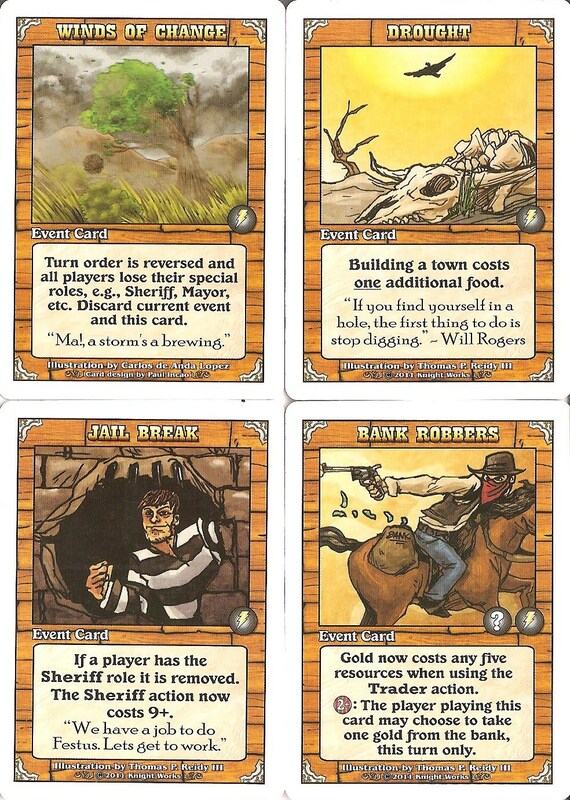 The Sheriff cannot be sent to jail, nor may he use an action card that would normally do so. Some of the more powerful action cards. Those action (and event) cards can provide some big boosts, so don’t overlook them. They really mix up game play, introduce some fun unpredictability, and provide for some replay value as you probably won’t use them all in one game. There are two action spaces that let you draw two or three of these cards. An event card must be played immediately, unless that’s all you draw – in which case, you draw again. Those events change a basic rule in some fashion, such as requiring extra resources to build. After resolving the event, if you have multiple action cards remaining, choose one. Some are played immediately, while others can be held for later application. These can be powerful – like letting you pay one gold for two influence points, or as in another that straight-up gives you a bonus die and any three resources of the same type. They can also toss in some interaction, and not of that non-passive, blocking stuff. No, here we’re talking about booting a player out of a restricted action box, stealing resources, or forcing one to lose influence. While harsh, those types of cards incur the aforementioned jail sentence, so you’ll want to think carefully before playing. The character cards also inject variety and replayability. Randomly assigned before play, these provide two things. One is a variable start condition. Each player begins with different resources, tokens, or maybe even an influence point or action card. Second, your character will have four unique, rule-breaking abilities. Just remember to apply them when applicable, something we had difficulty doing! These are all strong abilities, but not over-powering, and can really influence how you play. Character card and assorted tokens. The Sheriff gets the metal Deputy Die. The production value is good. I’m not a fan of the art, but it is by no means ugly. The wooden pieces are standard, the cardboard tokens are all nice and chunky, and the cards are thick and glossy. The only issue I have in my copy is the paper on the mounted board has some bubbling. But really other than that, this would be a finely made product for even a large publisher with the track record and resources. Considering it’s the first game for a one-man operation, I’d say it’s fantastic. Dark Horse moves at a nice pace with little downtime. Dice placement alternates by turn and resolving actions are fairly quick and simple. So you’re never sitting idle for very long. The fiddly parts only pop up when a player has to decide on when and how to use the various tokens, and despite the wealth of options, your dice will limit you to a practical handful. Analysis paralysis has not been an issue with us – and I’m known for it. The game is best experienced with 3-4 players to increase its competitive nature. The 2-player variant adds a new mechanic, and is fine. There’s also a solo variant which I have not played, and probably will not; but I know that provides an interesting option for others. Route building is the key to victory points and is smoothly integrated with the game’s other mechanics. There are only a couple of mechanics that can be a bit wonky. One is the “exploration” aspect. The majority of resource hexes are randomly pre-seeded at the beginning of the game, but upside down. Therefore, as you’re building and expanding out to claim them, you could end up with a disproportionate ratio of food to wood to ore. Additionally, some of these hexes are labeled as “rugged,” which require an extra ore resource to build a town upon, an expense you may not be prepared for. You can always play with them face-up, but the random pattern generation could still distribute them lopsidedly in your little corner of the West. Since there are ways to convert one type of resource for others, this isn’t always a major issue. The other wonky element can be problematic, although not as in a “broken game.” That has to do with the Influence track. If someone can collect influence quickly, it will bring the game to head much faster and force the other players to adjust accordingly. Obviously, there is no guarantee that he/she will be able to garner the rolls necessary, but we had one game in which it did happen. The others were caught with the slower building strategy until too late and that player won pretty much on his influence points alone. While it’s a valid tactic and totally legal, it was certainly based more predominantly on luck and just seemed out-of-sorts for a game about building and developing. But perhaps it’s a rare occurrence; our other plays witnessed a closer match of influence for influence as everyone progressed in development, too. Event cards can kick up a hornets’ nest! If you’re not into worker placement or Euros, you may find this outing somewhat repetitive. It’s actually kind of ironic that some Ameritrash characteristics, specifically luck and conflict, are folded into the design, but then so often countered by other Euro-centric mechanics. On the one hand there seems to be a desire to introduce some chaos. Yet on the other, that part of the game is tempered very much with elements that give players more control over it. The result is an experience that may not rope in Ameritrash gamers. Still, given the components to control the more chaotic elements, yes, there is still randomness and interaction. Of course, that is perfectly fine, really gives the title its character, and that is how it was designed. If you prefer all open information and total control, then Dark Horse is not for you. However, I don’t believe there is such an abundance of that purist persuasion, so the vast majority of Euro gamers should be able to handle those features without running to the hills. There’s too much going on to label Dark Horse a casual game, but nor is it an intense brain-burner. It has a nice medium weight and the 1-2 hour runtime is just about perfect for its style. 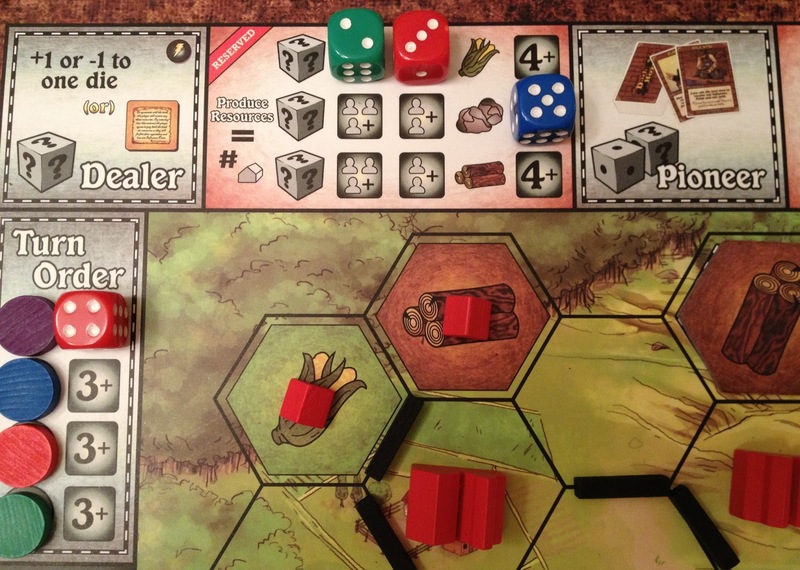 Since each turn consists of rolling and allocating dice and collecting bits based on those results, there is an inevitable repetitiveness, but thankfully the range of choices and variable mechanics prevent it from seeming tedious. So this very well could be a good fit for those looking at the next step up from introductory titles, as well as more casual fans into the Western genre. The really nasty actions can hurt, but will appropriately land you in the big house. Despite some randomness, elements of interaction, and its quintessential American theme, Dark Horse is still very much a Euro-style game of building and resource management. There are a few ways to overcome bad luck and typically more than one path to achieve your goal. With a tight and well-blended mixture of familiar mechanics, this title will be fresh enough for seasoned Euro gamers and fans of worker placement games. Its appeal beyond those circles will be hit and miss and generally more limited. As a fan of the theme and style, I’m happy with the addition to my collection. I expect that sentiment to prove true with other gamers. For those willing to “Go West” (and you don’t have to be young, nor a man), Dark Horse is a thoughtful, strategic design filled with lots of tough decisions and a few chance surprises that will challenge and entertain players until they ride off into the sunset. iSlaytheDragon would like to thank Knight Works Games for providing a review copy of Dark Horse.